LARGE FORMAT INTERACTIVE | MOUSE MARKETING INC. Create a powerful extension of your brand and discover how to generate a dynamic personalized engagement with your customers. We developed a campaign to attract new customers to the Golf Town Leaderboard Privileges Program. 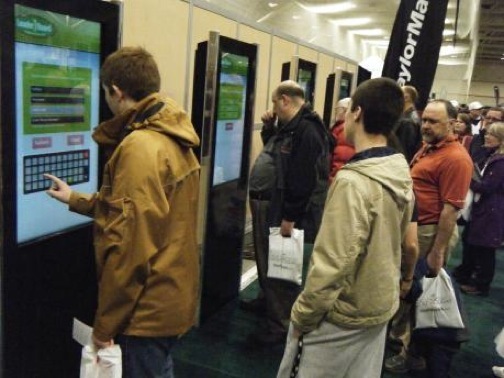 Our Golf Town brand ambassadors inspired people to enter at a series of large format interactive touch screen kiosks for a chance to WIN a $5,000 Ultimate Golf Gift Contest. The large format touch screens displayed high impact animated content with call-to-action to enter the contest. Crowds of golfers were naturally attracted to participate creating continuous line-ups and generating over 1600 “new” customers for the GolfTown Leaderboard Privileges Program. The 42″ large format interactive touch-screens included a customized application to capture the most important data fields through an intuitive interface that included a customer optin above capturing name, email, postal code (to track direct sales lift) and a interactive “what’s in your golf bag” section highlighting their “personal” product interests for follow-up marketing. About Golf Town Since our founding in 1999, Golf Town has grown to become Canada’s golf superstore. With 55 stores across Canada, we have everything you need to play your very best. Golf Town stores are sanctuaries where golf devotees come to try, buy, learn about and improve their game. With big box stores averaging 18,000 square feet, we carry an unprecedented selection of all the top brand names in golf, at the best prices. Whatever you are looking for – from clubs, bags and balls, to footwear, apparel, accessories and gifts – we’re a veritable golfer’s paradise. Become a member of our FREE benefits program and receive timely e-newsletters for all the latest and greatest in golf. As a member, you’re entitled to member-only offers, early notifications of events, launches and more.